Pleated filters using electret media have some distinct advantages over pleated filters using mechanical only media. The most important advantages of electret media filters is that they have lower pressure drop (resistance) and higher efficiency on smaller particles. In most cases the advantage of higher particle capture efficiencies for electret pleated filters are reduced as the filters are used. Some in the filter industry believe that the electret charge needs to be reduced or eliminated on filters being tested to give a “true” representation of the filters performance “in real life.” This is the principle behind the optional Appendix J of ASHRAE 52.2 and the mandatory IPA vapor discharge in ISO 16890. The question remains – Do either of these conditioning steps give a fair representation of what happens with the efficiency of electret pleated filters in use? In past articles we have covered this issue in some detail. In the article “The USA Should Not Adopt ISO 16890 – Here’s Why” (https://www.texairfilters.com/the-usa-should-not-adopt-iso-16890-for-air-filter-testing-heres-why/ ) and in the article “Comparing the Efficiency of Different Types of MERV 8 Filters in a Room Environment” (https://www.texairfilters.com/comparing-the-efficiency-of-different-types-of-merv-8-air-filters-in-a-room-environment/) we presented test results showing that new MERV 8 pleated filters with electret media had twice the removal efficiency on particles below 1um than new MERV 8 filters using mechanical only media. Even after 3 months of use in a commercial building the MERV 8 electret filters still had higher efficiency on sub-micron particles than either the new or used MERV 8 mechanical only filters. To artificially negate the advantage of electret filters in testing does not reflect these findings. Is this true? What is the loss in efficiency? Is it significant? In this project MERV 11 filters were purchased on the open market. One filter was sent for testing using the ASHRAE 52.2, Appendix J Conditioning step. The other filters were sent to homeowners across the US for use in homes. These “used” filters were then sent back to be tested using ASHRAE 52.2-2007 procedures. The results are presented below. The MERV’s have been added and are determined as per the ASHRAE 52.2-2007 efficiency tables. The initial ASHRAE 52.2 test on the “MERV 11” filter yielded a MERV 12 while the ASHRAE 52.2 test after Appendix J conditioning came out with a MERV 8-A. For every in-situ filter except for one, the tested MERV exceeded the MERV 8-A of the filter after Appendix J conditioning. In fact, three of the six filters that were in use from between 1.5 and 5 months showed a MERV 11 when tested. It is clear from this data that the Appendix J conditioning overstates the decrease in efficiency of electret filters and does not reflect “real-life minimum efficiency.” What the data shows is that while electret filters decrease in efficiency with use they continue to perform at a high level for an extended period of time. It is interesting to note that the Appendix J conditioning method has been criticized because it leaves too much of the charge in the filter media. This is one of the main reasons IPA vapor is the method of discharging filters in ISO 16890. It eliminates all electret charge – which results in test results that are even further from in-situ performance. Here is some new information – based on our own research project using an independent third party testing laboratory (Blue Heaven Technologies). We decided to test MERV 11 filters to see how they performed in real life. 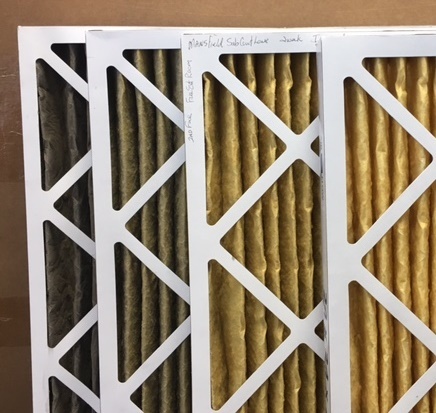 The four filters studied in this project were all produced in the same factory, using the same methods and the same materials. One filter was new. The other three filters were removed from commercial buildings where they had been used under normal operating procedures. The new filter was tested according to ANSI/ASHRAE 52.2-2012. The “used” or in-situ filters were tested using the “initial” test only since they had been “loaded” through actual exposure in the field. All filters were tested at 492 fpm. Information about use conditions of the used filters was not shared with the testing laboratory. First, the MERV 11 filters did not become MERV 7 filters. The assertion that they would is false. Secondly, the efficiency did decrease with use. All three filters – whether they had been in use for 1 month, 1 1/2 months or 4 months – wound up testing out at MERV 10. I have been explaining that due to the “margin of error” in testing, it is always a good idea to use the MERV of a filter +1 or -1. These test results fall within this margin of error. I, for one, would have no problem in explaining this to a customer. It is also interesting to note that the resistance on all four filters – new and used – was low. Even at 4 months of use the MERV 11 filter had a resistance 0.28″ wg. In short, the testing of these filters confirms the advantages of electret pleated filters stated at the beginning of this article. The MERV 11 filters tested had higher efficiency and lower pressure drop – both new and throughout their useful life. Have You Read the ISO 16890 Standard? Is ISO 16890 Adoption Related to PM1 Removal in Indoor Air?